Quivering in the open skies, swooping in the ocean breeze or standing vigil on fence posts, red kites, buzzards and kestrels are just some of the birds of prey that frequent the Cambrian countryside. However, our skies are much the poorer for lacking the majesty of one of Britain’s most impressive birds of prey; the white-tailed sea eagle (Haliaeetus albicilla). It is Britain’s largest bird of prey, an apex predator and the world’s fifth largest eagle. Measuring up to almost 1 metre high, with a gigantic wing span of 2.5 metres, it hard to believe anyone would want, or dare, to harm such a mighty creature. Yet sadly the last British white-tailed eagle was shot in Shetland in 1916 after centuries of persecution. Modern threats include human disturbance and habitat loss. Worryingly, this species is finding it hard to recover due to poisoning, often from mercury or organochlorides found in pesticides, which both kills the birds and limits their breeding success. Where eagles remain, the skies host a breath-taking courtship display of aerobatics, elaborate sky dances with a dazzling, final coup de théâtre. The male and female grasp talons, wheeling earthwards in a spiral, breaking off just before they hit the ground. An extravagant display, underpinned by a strong bond; sea eagles mate for life. They breed slowly, which hampers the species’ recovery. From around the age of five, females lay 1-2 eggs annually. Successfully raised clutches have the odds stacked against them, with around 60-70% of chicks failing to survive their first winter. The birds have brown plumage, with conspicuously pale heads and a white-tipped tail. Extensive breeding programmes began in Scotland in 1975, with infrequent reintroductions up until 2013. They have been ultimately successful, yet numbers are still very low. Their British habitat is confined to west Scotland, in far flung coastal regions, sea lochs, lakes and river valleys. Their territory ranges between 30-70km, and although they favour trees to cliff-top eyries for nesting, they rarely settle far from water, and fish are an important part of their diet. White-tailed eagles also eat small birds, ducks and will scavenge carrion. They are rather brazen opportunists, and will steal fish from other birds, and sometimes even otters! Norwegian translocated eaglets began the Scottish populace, and Norway and Russia have the biggest populations. There are varying, scattered populations globally. Reintroduction can be met with opposition by farmers, who fear for their lambs. However, conservationists working closely alongside the birds say they are unlikely to kill livestock where wild food sources abound. Scientific studies in Scotland and Norway have found eagle attacks on lambs rare, they are more likely to eat a dead lamb, or one that has been attacked by hooded crows, who have a gruesome habit of pecking their eyes out. Mysterious folktales and mythologies surround the white-tailed eagle, and they have folkloric links with druids. The remains of 35 eagles were found alongside hundreds of human remains in a 3000-year-old tomb—known as the Tomb of Eagles—in Orkney, suggesting the bird was a totem animal in the Neolithic period. Eagle remains have also been found in caves in the Gower and Carmarthenshire. The great bard Taliesin wrote of the white-tailed eagles’ habit of scavenging battlefields, and early Welsh literature depicts them as symbols of great power. 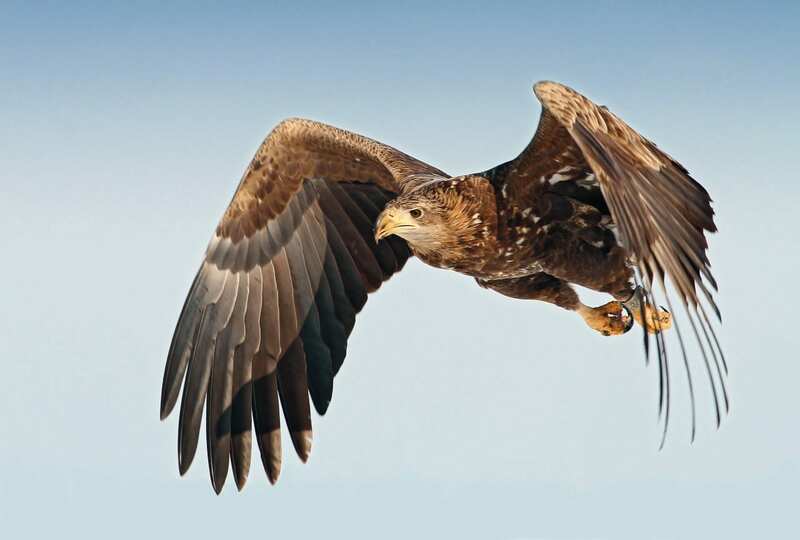 Shetland fishermen believed that white-tailed eagles, or ‘Erne’ (Anglo Saxon for ‘The Soarer’) flying overhead would cause fish to rise to the surface, belly-up, ready for the taking, a superstition that extended to Shetland fishermen smearing their hooks with the fat of the eagles. In Gaelic, the white-tailed eagle is poetically named Iolaire Suile na Grein, the ‘Bird with the Sunlit Eye’. It is enchanting to think that Cambrian Wildwood could one day play host to this distinguished guest. Imagine the thrill of walking among the Cambrian hills, when suddenly the sun is blocked out by a colossal eight- foot wingspan. You look up as the white-tailed eagle soars above you. You are close enough to see the white-tipped tail feathers, the huge club-like wings, the protruding hooked beak. Perhaps you are close enough to see the solemn, enigmatic expression on the eagle’s face, to be humbled by the echo of something ancient and mysterious that lives in their clear pale eyes.